Lockheed Martin (NYSE: LMT) has announced a new generation of space technology that will launch this year that will allow satellites to change their missions in orbit. Satellites that launched one, ten or even 15 years ago largely have the same capability they had when they lifted off. That’s changing with new architecture that will allow users to add capability and assign new missions with a software push, just like adding an app on a smartphone. This new tech, called SmartSat, is a software-defined satellite architecture that will boost capability for payloads on several pioneering nanosats ready for launch this year. • The Linus project delivers two 12U cubesats performing a technology demonstration mission, validating SmartSat capabilities as well as 3D-printed spacecraft components. • Pony Express builds multiple 6U satellites destined for a low Earth orbit and will space qualify state-of-the-art networking technologies. Pony Express 1 is a pathfinder for a software-defined payload that will test cloud computing infrastructure and was developed in nine months. Follow-on Pony Express missions will prove out RF-enabled swarming formations and space-to-space networking. SmartSat uses a hypervisor to securely containerize virtual machines. This is a technology that enables a single computer to virtually operate multiple servers to maximize memory, on-board processing and network bandwidth. It takes advantage of multi-core processing, something new to space. That lets satellites process more data in orbit so they can beam down just the most critical and relevant information — saving bandwidth costs and reducing the burden on ground station analysts, and ultimately opening the door for tomorrow’s data centers in space. 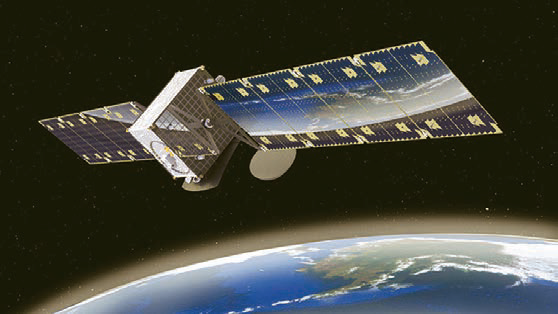 SmartSat uses a high-power, radiation-hardened computer developed by the National Science Foundation’s Center for Space, High-performance, and Resilient Computing, or SHREC. Lockheed Martin helps fund SHREC research, and in turn gains access to world-class technologies and student researchers. Rick Ambrose,EVP of Lockheed Martin Space, said this new type of satellite acts more like a smartphone. Add a SmartSat app to a satellite on-orbit and the mission is changed. The company is the first to deploy this groundbreaking technology on multiple missions. 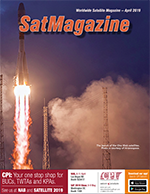 SmartSat will give customers unparalleled resiliency and flexibility for changing mission needs and technology and unlocks even greater processing power in space. 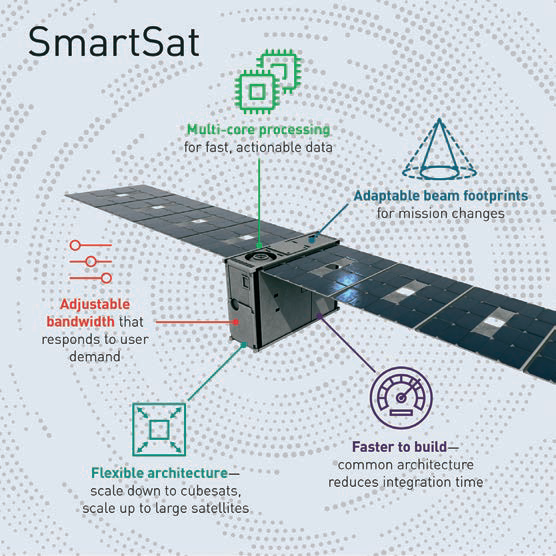 SmartSat is a major step forward in our journey to completely transform the way we design, build and deliver satellites. Ambrose added that the LM 50 bus is the perfect platform for testing this new, groundbreaking technology. Lockheed Martin is self-funding these missions to demonstrate a number of new capabilities that can plug into any satellite in the firm’s fleet, from the LM 50 smallsat to the flagship LM 2100. The same technology plugs into ground stations, improving space-ground integration, as well as one day be able to connect directly with planes, ships and ground vehicles, connecting front-line users to the power of space like never before. 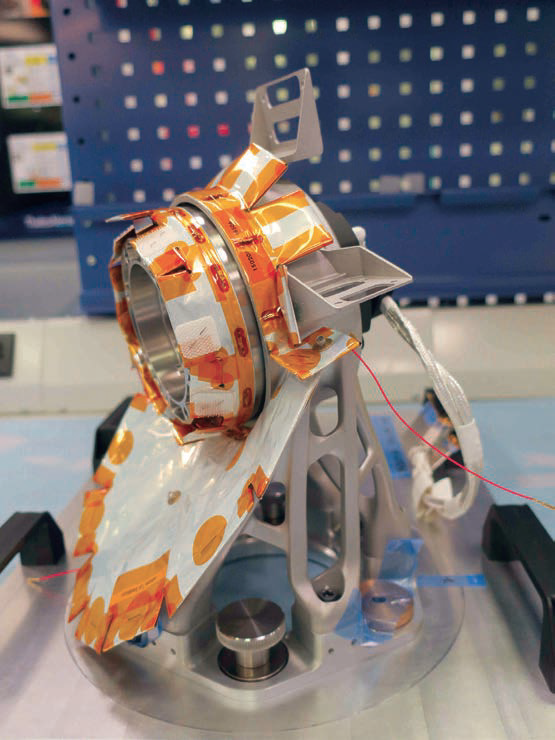 Thales Alenia Space first used additive manufacturing a few years ago with the 3D-printed aluminum antenna brackets for the TurkmenAlem/MonacoSAT satellite, launched in 2015, and the polymer tube supports for the Iridium® NEXT constellation. The Koreasat 5A and 7 telecommunication satellites, orbited in 2017, featured the largest 3D-printed spacecraft parts ever manufactured in Europe at the time. Today, Thales Alenia Space is taking 3D printing into series production to make components for telecom satellites built on the company’s new all-electric Spacebus Neo platform. Spacebus Neo will feature four reaction wheel brackets made of aluminum and 16 antenna deployment and pointing mechanism (ADPM) brackets: four in aluminum and 12 in titanium. The innovative 3D-printed reaction wheel bracket is designed to meet market demand for lower costs, now reduced by about 10 percent, and shorter lead times, with production schedules cut by one to two months. The new part is also 30 percent lighter and offers improved performance. The metal powder-bed fusion technique used for these parts allows series production with a high degree of customization, making it possible to tailor designs to the exact requirements of each new mission. 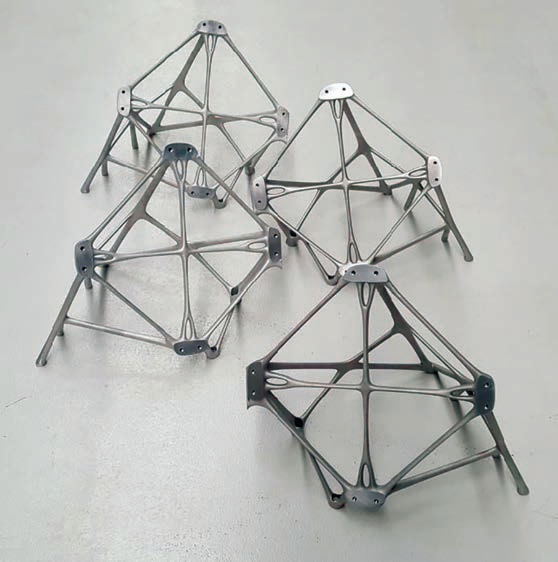 The four reaction wheel brackets for each satellite, for example, are 3D printed as two sets of symmetrical parts, while the orientation angles and interfaces of the ADPM brackets can be adjusted to their specific function and position on each satellite. thereby avoiding additional assembly requirements. Philippe Sicard, engineer at Eutelsat, said the company is now fully involved in the development and use of 3D-printed satellite parts at all stages of the process, from design to final delivery. These parts are recognizable by their highly specific design. To ensure the most stringent quality standards, the overall process and individual components are robustly traceable and Eutelsat has established a comprehensive testing and inspection process. Kleos Space S.A. (ASX: KSS, Frankfurt: KS1) has signed a collaborative, non-binding Memorandum of Understanding (MoU) with Israeli-based end-to-end geospatial intelligence company ImageSat International N.V. (iSi) to explore opportunities to use Kleos’ maritime RF activity-based satellite data to enhance geospatial intelligence analytics. 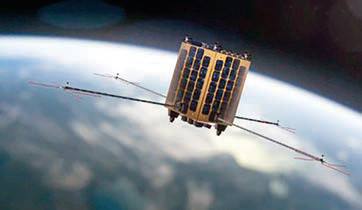 Artistic rendition of a Kleos Space EO satellite. Under the MoU, the companies will develop a value-add proposition for current and future iSi maritime customers using Kleos’ geolocation data. The MoU also covers the development of a methodology to reduce collection to dissemination latency. iSi has more than 20 years’ experience in end-to-end space, intelligence and analytical solutions for defence and intelligence customers. Israel-based, the company’s areas of expertise include integrated ISR solutions, Very High-Resolution satellite services, GEOINT and data analysis. Its innovative ground-segment is designed to manage high-revisit satellite constellations. Kleos is on track to launch its initial Scouting Mission satellites on a Rocket Lab Electron rocket from New Zealand by the end of the second quarter of 2019. The multi-satellite Scouting Mission system will form the cornerstone of a constellation that delivers a global picture of hidden maritime activity, enhancing the intelligence capability of government and commercial entities when AIS (Automatic Identification System) is defeated, imagery unclear and targets out of patrol range. Andy Bowyer, CEO of Kleos Space said the launch of the company’s Scouting Mission satellites will enable the firm to commence generating revenue by delivering this commercially available data-as-a-service through collaboration with strategic global partners within the defence and intelligence sectors. ArcGIS Living Atlas of the World is the world’s foremost collection of maps developed by Esri partners and the Esri user community and is available in ArcGIS Online, Esri’s flagship cloud-based geospatial platform. These enhancements will accelerate the speed at which analysts distill actionable intelligence from sources of geospatial data to solve a variety of problems and missions globally. NaturalVue® 2.0 is Maxar’s next-generation global image mosaic, encompassing over 60,000 Landsat 8 images. As the highest quality global, commercially available, and virtually cloud-free 15-meter mosaic with current imagery, NaturalVue® 2.0 provides a seamless basemap that reflects the Earth’s true colors. NaturalVue® 2.0 updates and improves upon previous versions with enhanced positional accuracy, color fidelity and spatial resolution. Maxar’s image mosaic portfolio also includes Vivid and Metro mosaics, which are the highest resolution global mosaics available commercially. NaturalVue® 2.0, Vivid and Metro enable a broad range of geospatial and web-based mapping applications, including military and defense logistics, GIS backdrops, flight simulation, cartographic mapping, 3D visualization and GPS tracking. NUCI is Maxar’s commercial urban change detection product, which highlights areas of new construction activity by isolating changes that persist over time, derived from over 13,000 Landsat images. 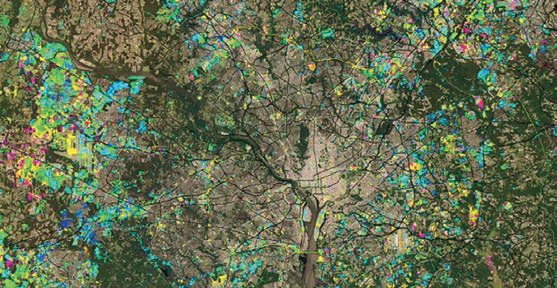 NUCI enables analysts to rapidly identify areas of urban expansion across the landscape of the continental United States by filtering out noise from seasonal, agricultural and other natural cycles that hamper traditional image-to-image change detection methods. The dataset includes an archive covering nearly 30-years of change. JetTalk, a joint venture between SatixFy UK Limited and ST Engineering, is bringing their state-of-the-art In-Flight Connectivity (IFC) satellite Aero terminal, based on SatixFy’s Electronically Steered Multi-beam Antenna Array (ESMA) technology, to the Aircraft Interiors Expo, April 2-4, held at the Hamburg Messe, Germany. JetTalk’s Aero all-in-one terminal is fully electronic. With no moving parts, it allows fast and simple installation, maintains the highest reliability and is low maintenance. Able to simultaneously communicate with multiple GEO/MEO/LEO satellites, the terminal provides aircraft passengers with continuous seamless broadband IFC. The terminal supports acquisition and tracking capabilities for multiple beams at multiple polarizations and integrates SatixFy’s next generation modem baseband ASIC for a comprehensive terminal solution supporting any external modem. Charly Ben Chetrit, the JetTalk Chairman, said that with high demand for onboard real-time video streaming over the internet and high bandwidth consuming social media applications, 300 to 450 passengers in larger jets will soon require a grade of service of up to 1 Gbps during flights. Moreover, most local and regional lines run by single-aisle aircraft are eagerly awaiting an IFC solution that has a quick and simple installation and calibration to compete in the market and offer added value services to their passengers. Each tile is ESMA based, containing SatixFy’s family of dedicated System on a Chip (SoC) devices. 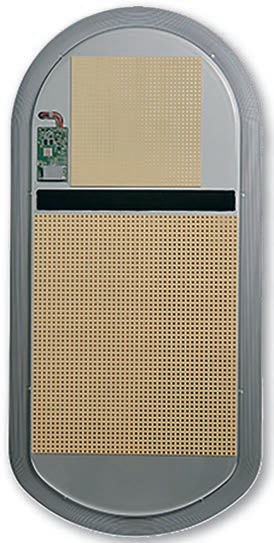 The Beamformer (“Prime”) is an industry-new true-time delay chip for pointing and tracking multiple beams from an array of radiating elements. Each element is connected to the RFIC chip (“Beat”) which serves as up and down converter LNA and PA per element. Together, the Prime and Beat create the basis for the ESMA tile. The Aero terminal offers embedded LEO/MEO support, is software configurable and enables customers the flexibility to migrate to new constellations when available, and with inherent make-before-break capability. 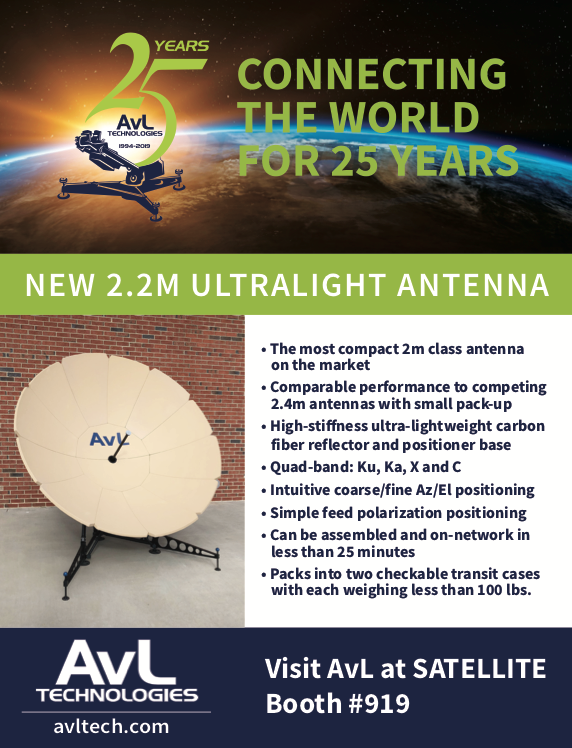 Wind River® has announced that Astranis Space Technologies Corp. is using the company’s VxWorks® real-time operating system for its next generation satellite that will deliver cost-effective, high-speed internet to underserved markets. More than half of the world doesn’t have access to the internet — and satellites are expected to play a major role in solving that problem. Astranis is building satellites that are capable of delivering broadband internet services to individuals around the globe. It targets areas where, due to the high cost of building the infrastructure, broadband internet isn’t widely available or is completely unavailable. In addition to its VxWorks for safety- and security-critical environments, the company offers Wind River Linux and other commercial-grade open source technologies for general purpose functions. The recently launched Wind River Helix Virtualization Platform is for consolidating multiple federated systems with both safety-critical and general purpose applications onto a single compute platform. For system simulation enabling unmodified target software to run on a virtual platform the same way it does on physical hardware, the company offers Wind River Simics®.